One of the biggest smartphone companies in the world, Huawei has announced its new Honor 6X smartphone. At the Consumer Electronics Show 2017, the Chinese phone maker unveiled the newest entry in the Honor X series. The phone is geared towards mid-range users with a price tag to match ($249). The overall design is similar to last year’s Honor 5X but with one major difference; a dual camera setup on the back. The 2.5D glass now merges with the metal body in a more seamless fashion compared with the glass front of the Honor 5X. It still has the same unibody metal design as the Honor 5X as well with a fingerprint sensor at the back. The screen employs a 5.5 inch 1080p (1920 x 1080) IPS display unit. This is also similar to last year’s Honor 5X. Huawei Honor 6X comes with an Octa-core HiSilicon Kirin 655 processor clocked at 2.1 GHz. There are two variants for storage and RAM with a 3 GB/32GB flavor and a 4 GB/ 64 GB variant. It also allows 256 GB of expandable storage via microSD card slot (uses 2nd SIM slot). The phone is dual-SIM by default. 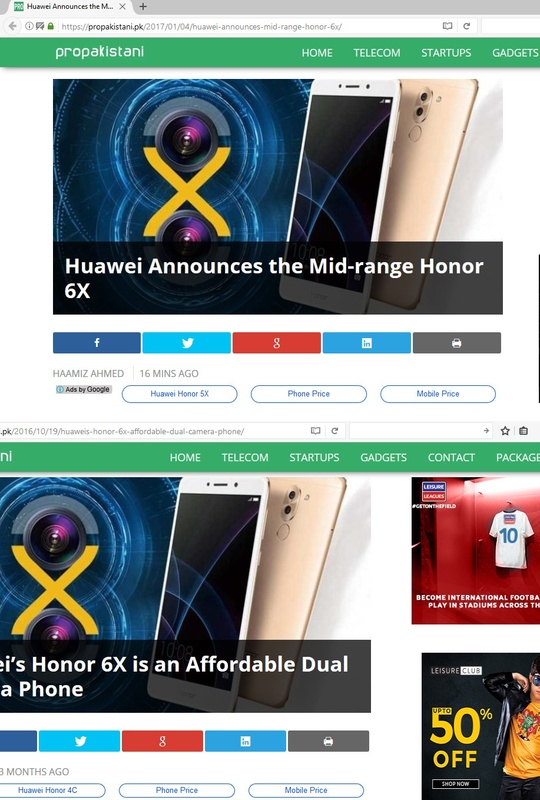 Unfortunately Honor 6X features last year’s Android 6.0 Marshmallow with EMUI 4.1 compared with EMUI 5.0 of the newer Mate 9. Huawei says an upgrade to EMUI 5.0 is coming soon which will improve the user experience on the Huawei Honor 6X. Huawei’s dual-camera game has been refined over last year and the company seems confident enough to use it in lower end phones as well. The Honor 6X features a 12MP sensor coupled with a 2MP sensor to enhance low light performance by capturing images in black and white for added depth and sharpness. It also features what Huawei calls Deep Trench Isolation (DTI) which reduces noise in photos by isolating pixels to decrease blur. The battery has been bumped up to 3,340 mAh up from 3,000 mAh in the Honor 5X. It does not feature any sort of fast charging technology though. Huawei claims that it can last more than a day on heavy usage. Overall this phone features upgrades over last year’s design but falls short in some aspects. The phone will be available from Huawei’s website on January 10th. No word on its release in Pakistan yet, but it is safe to assume that this phone won’t be here until the end of a month at least. Hate to break it to you, but 6X was announced 3 months ago. Look there was even a post at ProPakistani. This phone is already available for sale in several markets and coming to Pakistan this month. This phone was announced at Consumer Electronics Show just now by Huawei. Will be available “officially” after a few weeks. At CES it is “launched” for US Market. It is already available in several other markets including China starting as low as $150. Secondly its going to be available from January 4th in majority of the markets, in the US, the UK, France, Germany, Spain, Italy, the Netherlands, the United Arab Emirates, Saudi Arabia, Iran, and Iraq. It was out in China only early on. I find a bug, written in specification,android 6.0 lollipop replace it with Android 6.0 Marshmallow! It was announced on 18th October 2016 Event bro. Announced and released in oct 2016 .